The parents of the released Dapchi schoolgirls and the Federal Government may be set for a showdown on the plan of the government to send the released schoolgirls to continue their education at the Government Girls Science and Technical College, Dapchi, Yobe State. While some parents have vowed that their daughters would not return to the GGSTC, Dapchi, to continue their education, the Federal Government insisted the girls would resume normal academic activities this week in the school where the girls were abducted. Boko Haram terrorists had released the girls dramatically on Wednesday in Dapchi while they were brought to Abuja to meet with President Muhammadu Buhari on Friday. 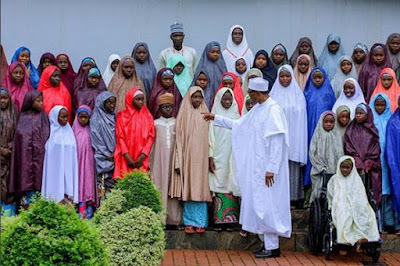 Five of the 110 girls, abducted on February 19, reportedly died of shock on the day of their abduction while one, Leah Sharibu, who was said to have refused to renounce Christianity, is still being held by the Islamic insurgents. The Secretary, Abducted Dapchi Girls’ Parents Association, Mallam Bukar Kachalla, disclosed the parents’ position in a telephone interview with The Punch. According to him, the parents have resolved to relocate the girls because they have lost confidence in the security arrangements in the town and the determination of the parents not to further put the lives of the girls in danger. The parents’ position emerged a day after the Vice-Chancellor of Nigeria Turkish Nile University, Prof. Huseyin Sert, offered to award scholarships to the schoolgirls to pursue their education. But the Federal Government said the freed girls would return to Dapchi and continue their education at the GGSTC this week. The Minister of Information and Culture, Alhaji Lai Mohammed, who stated this in an interview with The Punch in Abuja on Saturday, also allayed the fears of parents concerning the schoolgirls. But Kachalla stated, “We have decided that none of the girls released will go back to the school even if the government provides all the security in the world in the school. "Our resolve is predicated on the fact that we have been having security (presence) in Dapchi for the past five years, but the security (operatives) were suddenly withdrawn; and 21days after, the town was attacked and the girls were abducted.